It's and we hope our official online edition of the Salt Lake Tourist & Visitor Center answers all of your questions. 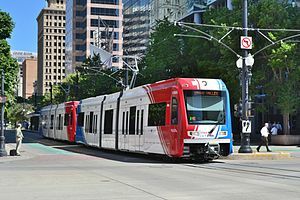 This page provides detailed information on Salt Lake City Public Transportation - Trax Light Rail Info. UTA operates a light rail system that connects communities throughout Salt Lake County. This above ground subway known as Trax, began light rail service in december of 1999. There are many stations, so if you stay at a hotel in the Salt Lake Valley, you can get downtown very quickly. Red line: Travels from the south valley city of South Jordan to the University of Utah with stops in South Jordan, West Jordan, Sandy, Midvale, Murray, South Salt Lake, Downtown Salt Lake, as well as the University of Utah campus. Blue Line: Services Sandy, Midvale, Murray, South Salt Lake and the downtown Salt Lake City area. Green line: Services the towns of West Valley, travels east to South Salt Lake and then north into Downtown Salt Lake City. The Airport line, an extension of the green line from Downtown west to the Salt Lake City International Airport opened and now the travel time to and from the SL airport to downtown Salt Lake City Centre is appx. 20 minutes. Since Trax is not a 24-Hour operation, those hoping to catch the first flights of the day or who will be arriving late won't be able to add a train to their travel plans. Why? The Airport Line's first run of the day arrives at the airport at 5:46 a.m., and the days latest departure from the airport is 10:37 p.m. So, as now scheduled, nine regular flights leave less than an hour after the first UTA arrival and 17 arrive after the final train leaves the airport. Visitors planning to use this option early morning or later in the evening will have to make other plans for transportation, preferably cabs or shuttles. Trains stop every 10 to 30 minutes between 5:30am and 11:00pm on weekdays and Saturday (Now until 1am on the weekends). Limited service on Sundays. Trax Schedules There are also free Park and Ride lots at most stations excluding downtown. The standard one-way fare within the valley is $ 2.50 Roundtrip is $5.00 - A large section of the Downtown area, including Temple Square and the area just west of the State Capitol is a fare free zone and there is no charge if commuters or visitors enter and exit a bus or TRAX between the designated streets. Full-fare tickets can be purchased from vending machines or when boarding the bus. Cash, credit and debit cards are acceptable forms of payment. These tickets are valid for two hours from the time of purchase and can be used as often as necessary on both buses and light rail. A full day pass is valid for unlimited rides on buses and TRAX for $ 6.25 These passes can also be bought at vending machines or from Pass Sales outlets at supermarkets and other retailers. They are the most convenient because they are self-validating and can be purchased in quantity and used as needed. The latest monthly ridership numbers were reported to be at 60,600, making it the ninth-busiest light rail system in the country.